THURSDAY, April 13, 2017 (HealthDay News) -- A pair of key differences in the brain may help distinguish which seniors are at risk of falling prey to financial scams, a small new study suggests. The first-of-its-kind study found a biological basis -- rather than poor decision-making skills -- underlying financial exploitation in the elderly. These findings might lead to a way to predict which seniors are susceptible to scams, the researchers said. Such scams affect about 5 percent of older adults after age 60, said study author Nathan Spreng. He's director of Cornell University's Laboratory of Brain and Cognition. "We suspect these are brain changes that occurred prior to [seniors] being exploited that rendered them vulnerable to exploitation... It could have been something that emerged as they were aging," Spreng said. "We think it's probably more of an age-related change to the brain," he added. "We don't necessarily think this is a lifelong brain difference." About 45 million Americans were age 65 and older in 2013, according to the U.S. Census Bureau. The true incidence of financial scams in this age group is probably underestimated. Spreng said that many older adults are unaware that they were scammed or unwilling to report being exploited. 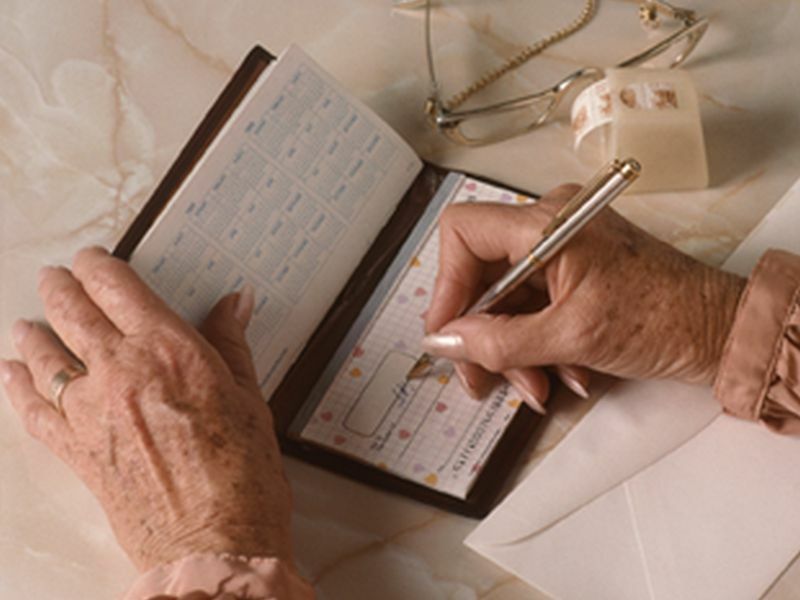 Prior research indicated that family members are the most common financial abusers of seniors. In Spreng's study, a grandson continued to steal even after being confronted by the study participant. In other examples, a daughter charged $2,000 to a study participant's account without permission, and a son's girlfriend borrowed $4,000 and never paid it back. Spreng and his team evaluated 13 older adults who had been robbed by family members or neighbors, or scammed online or by phone. The researchers compared that group to 13 peers who'd been exposed to a potentially exploitative scheme, but recognized and avoided it. Forty-five behavioral tests were performed on both groups to measure aspects such as memory, personality, financial reasoning, and the ability to pay attention to information and evaluate it. Additionally, MRI scans were performed on the participants' brains. The only behavioral difference that emerged between the groups was more anger and hostility in those who'd been scammed. But the brain images were more telling: Exploited seniors showed more shrinkage and less connectivity in two key areas of the brain. One brain region, known as the anterior insula, signals when something significant is happening. This area was significantly reduced in the exploited group of seniors, which suggests their brains weren't signaling that they faced a risky situation, according to the study authors. The other brain region, called the medial prefrontal cortex, helps read social cues, such as people's intentions. The scammed seniors also showed more shrinkage and fewer neural connections in this area, the findings showed. The researchers also found the networks of both affected brain regions were more connected to each other. This suggests the combination of effects might leave those seniors more vulnerable to scams. S. Duke Han is a spokesperson for the American Federation for Aging Research. He said this study's results are preliminary because of the small number of people studied. "There also could be other reasons for why these brain imaging differences might be seen -- there may be differences in cardiovascular health, nutrition or another variable not accounted for, and this isn't a large enough study to address those," said Han. Han and Spreng agreed that studying financial scams in the elderly is a difficult task. "The topic can be seen as very embarrassing for older adults who become the victims of financial exploitation, so it's hard to get them to agree to be recruited for this type of research," Han said. Larger studies are needed to confirm these findings and perhaps identify markers -- both biological and behavioral -- to identify who's most at risk of scams, Spreng said. "Overall, our objective is to help with identifying people who may be vulnerable but don't know it, and help build up additional protections for them," Spreng said. "The consequences are just so devastating for people's well-being and quality of life and, ultimately, their health when they lose their life savings. We're trying to tackle this problem as a biological issue," Spreng said. The study was published March 28 in the Journals of Gerontology.